And all this time I’ve been working. Smitten Kitchen’s Sour Cream Pancakes. These were wonderful! Tangy and fluffy, perfect for dousing in maple syrup with a side of strawberries. A solid breakfast is always best way to start my day. Curry Creamed Chicken with Couscous Salad. I used to make this all the time when I first started living on my own but my need for variety and the staggering amount of good recipes I have yet to try have prevented me from making it the past few years. I revisited my old favorite and can only say that I usually double the cream sauce because it’s so delicious. This dish comes together in under 20 minutes and it’s great for a weeknight meal (and fairly healthy too besides the cream). Annie’s Eats Chicken Ranch Pizza. There was a sale on fresh pizza dough at my local supermarket this week so I stocked up and made a bunch of pizza. This is one of my favorite pizzas ever! I’ve made it at least half a dozen times now and Boy can’t get enough. Chicken BBQ pizza. With my extra pizza dough I just threw on about 1/4 c barbecue sauce (hickory smoked), 3/4 c shredded mozzarella, caramelized red onion, and cooked chicken, and called it a day. Simple but delicious just the same. Makes 16 or 1 8×8″ square pan. Line an 8×8″ baking dish with aluminum foil and lightly grease with extra butter. (I found it easier to grease the foil first and then place in the pan. In a medium saucepan over medium heat, combine the condensed milk and chocolate chips. Stir occasionally until the chocolate is completely melted and the mixture is smooth. Take the pan off the heat and stir in the vanilla and salt. Quickly pour the mixture over the graham cracker base and smooth with a spatula. Sprinkle marshmallows over the chocolate and gently press them in so they are anchored. 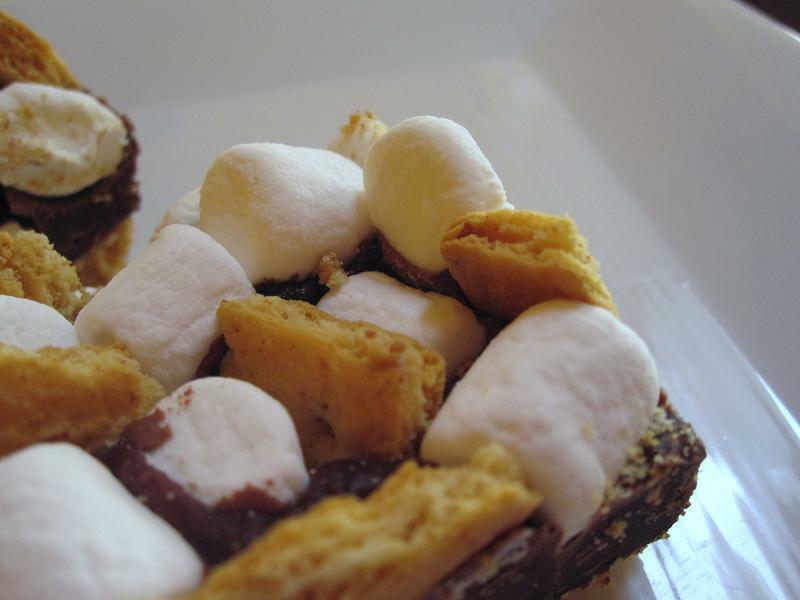 Break up the whole graham crackers and insert between the marshmallows. Cover and refrigerate about 4 hours or until firm. Cut into bars and serve cool. When was the last time you carpe diem’d? I love these..They look excellent!!! i’m glad you’ve been having so much fun and eating such good eats! I need to try that creamy curry chicken. I have a feeling it will become my new addiction. And I’m okay with that. 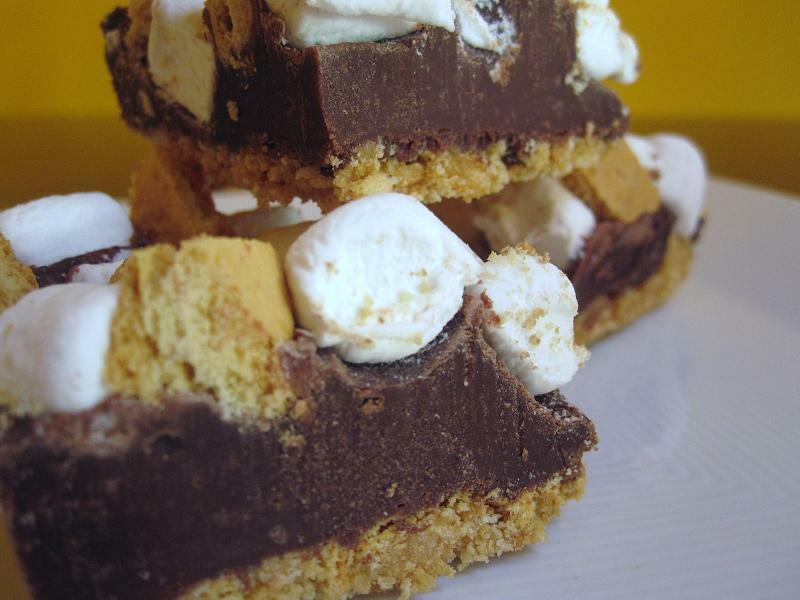 Smores are one of my favorite desserts and these bars look fantastic! Love that they only take 10 minutes. Since that’s all I have to spare on any given day. do you think it will work with white chocolate? Hi Mandy! I think white chocolate would make it very sweet but maybe if you broke up the chocolate with some dried cranberries (or something else a little more on the tart side) it would work. Oh be still my heart. I love chocolate and I love graham crackers so what more could one ask for! Amazing girl- thanks for sharing! Mmm I adore s’mores and thus anything inspired or related to them. These look great! 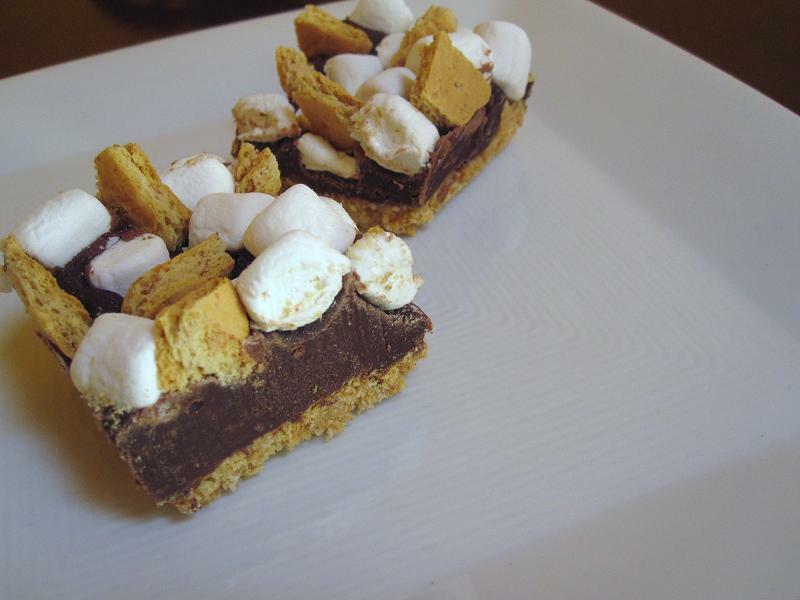 I made another version of s’mores bars and posted them years ago that uses marshmallow fluff instead of whole marshmallows and has ground graham cracker crumb crust/topping. Slightly more complex to make (especially if you make your own fluff like me) but gooey and so good!